Surprisingly, eye twitching, eye spasms, and eyelid twitching are common symptoms in a lot of people. What does it mean when your eye twitches? You could be sitting at work at your computer, and suddenly there is this irritating constant eye twitching. The uncontrollable blinking commonly affects the upper eyelid, but it may occur in both eyelids. What is eye twitching exactly? The medical term for eye twitching is blepharospasm, or when the condition is chronic, it is called benign essential blepharospasm. Eye twitching will usually affect the eye muscles of each eye, and you may experience sudden eye spasms every few seconds; it usually lasts for about one to two minutes. A lot of times eye twitching is harmless and painless, except for the fact that you may find it annoying. However, an eyelid twitching episode is very unpredictable. For instance, the sudden eye twitching may occur on and off for a period of several days. After that the person may not experience eye twitching for weeks or months between episodes. The majority of people will only feel a mild eye spasm. It is like there is a gentle tug on the eyelid. Other times the strength of your eye spasm will force your eyelid to shut completely close. On the other hand, some people never seem to develop any noticeable eye twitching signs. Eye twitching is also sometimes worsened from bright light, anxiety, and fatigue. 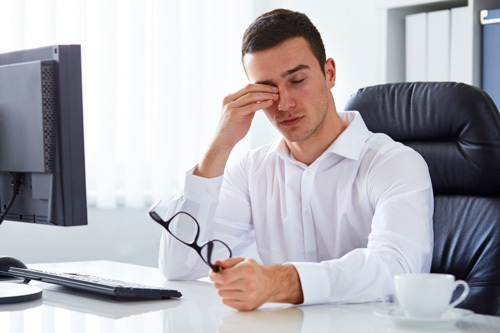 An eyestrain is a common reason for your eye twitching. It will result when your eyes become tired from overuse, including from staring at the computer screen or your digital device for long periods of time. In this case, your eyes may trigger eyelid twitching from working too hard. Schedule an eye exam if the eye twitching is persistent since vision correction may be necessary. Eye twitching causes also include short-term stress, over-tiredness, and general fatigue. There are lots of symptoms associated with stress, and the most common are low energy, headaches, digestive problems, and lack of sleep. Eye twitching is another telltale sign of stress when it is linked with vision problems. Sometimes stress is also connected to sleep problems. When this is the case, reducing the stress can improve sleep and end the eye spasm. It is also believed that excessive caffeine or alcohol consumption can lead to eye twitching. It is best to cut down on your alcohol or caffeine if eye twitching has been a problem after you’ve recently consumed your intake of the substances. It is thought that over half of older adults suffer from dry eyes. Causes of dry eyes can include caffeine and alcohol consumption, computer use, wearing contact lenses, tiredness, stress, and taking certain medications like antidepressants or antihistamines. In turn, eye twitching may also be a problem. It is also possible that an eye spasm can be triggered by certain nutritional deficiencies. For example, electrolytes are electrically charged minerals that are responsible for controlling the muscles of the eye. An electrolyte imbalance can lead to muscle spasms and twitches, which can also result from dehydration. Electrolytes that can lead to eye twitching include magnesium, calcium, potassium, and sodium. Other nutrient deficiencies linked with eye twitching include vitamin B12 and vitamin D.
People with eye allergies are also at risk of eye twitching. Histamine is released into eyelid tissues when the eyes are rubbed. Some evidence suggests that histamine can cause eye twitching. Try taking a natural antihistamine if you are prone to allergies such as vitamin C or quercetin. Your eye spasm or eye twitching can be caused from physical exertion, lack of sleep, eye irritation, dizziness, the use of tobacco, light sensitivity, and environmental irritants. In benign essential blepharospasm, certain eye conditions can also worsen eye twitching, including conjunctivitis (pinkeye) and blepharitis (inflammation of the eyelid). Eye twitching can be a side effect of certain medications. There are potential health complications associated with constant eye twitching. On rare occasions, eyelid twitching is a symptom of far more severe movement, nerve, or brain disorders. This is especially true when there are other uncontrollable movements or facial twitches along with your eye spasm. What are nerve, brain, or movement disorders that can cause eyelid twitching? Parkinson’s disease: Eye twitching is common in Parkinson’s disease, and it can be an early warning sign of the disorder. In a study published in the journal Archives of Neurology in 2012, 112 patients with Parkinson’s disease (PD) experienced eye twitching. This included new PD patients who were not currently on medication. Multiple sclerosis (MS): Multiple sclerosis (MS) is a central nervous system disease known for symptoms like tingling sensations and muscle weakness. This can lead to movement problems like eye twitching. Dystonia: Dystonia is a movement disorder that causes involuntary muscles spasms, including eye twitching. Someone with dystonia will experience tremors, twisting body movements, and unusually contorted postures. Some patients experience movement in the entire body, while others are only affected by one body part. Cervical dystonia: Cervical dystonia is also called spasmodic torticollis. It is known to cause random spasms in the neck and head. It can also cause the head to go backward or forward controllably. As a result, eye twitching may also occur. Bell’s palsy: Bell’s palsy is a type of paralysis disease that causes one side of the face to droop downward. The condition is also called facial palsy. Eye twitching is considered a side effect of the disease. Tourette’s syndrome: Tourette’s syndrome is a condition where involuntary movement and tics are common. In particular, eye twitching may occur in some people with Tourette’s syndrome. How to Treat Eye Twitching Naturally? Many eye spasms resolve without any treatment, and they will go away within a few days or weeks. Other times treatment is required. As a result, your doctor may recommend physical therapy, anxiolytics, or surgery. A myectomy is a type of procedure used to remove some of the nerves and muscles in the eyelids. The surgery will also treat severe benign essential blepharospasm cases. On other occasions, Botox injections are used to treat benign essential blepharospasm. It involves injecting botulinum toxin type A into the muscles of the eyelid, and in most cases the treatment is often repeated. Ubiquinol is considered the most bioactive form of coenzyme Q10 (CoQ10). CoQ10 is a common supplement that helps with muscle pain, migraines, and tiredness. Those with Parkinson’s disease should ask their doctor before using CoQ10. Acupuncture, acupressure, and massage therapy are all methods that help reduce eye twitching by increasing eye circulation. Acupuncture helps relieve chronic pain and eye twitching. Effective acupuncture points that help alleviate eye twitching include gallbladder 14, stomach 2 and 3, yin tang, small intestine 18, and triple warmer 22. Light eyelid massage has also been found to increase circulation, as well as strengthen and stimulate muscles. Biofeedback therapy is a method that helps control various bodily functions that will normally occur involuntarily, including muscle pain, tension and spasms. Electrodes are attached to the skin and these processes are measured and displayed on a monitor. Through trial and error, a person can learn mental activities that can reduce eye twitching. Stress and fatigue are causes of eye twitching. As a result, there are various relaxation techniques that help decrease stress and improve energy, including yoga, meditation, and tai chi. A multivitamin and mineral supplement can also help people with deficiencies related with eye twitching, including vitamin B12 and vitamin D, and electrolytes like magnesium and calcium. Magnesium and calcium are both important for the maintenance of the nervous system. What are other ways to treat eye twitching? Psychotherapy can help someone with Tourette’s syndrome. It can also help to try chiropractic treatment, hypnosis, and eye hydrotherapy. It is also a good idea to increase your water intake, and get at least seven to eight hours of sleep. Black current and bilberry are also berries that promote circulation to the eyes, and can help reduce your eye twitching episodes. Wearing sunglasses can help reduce light sensitivity associated with eye twitching. Keep a journal and note when you have an eye spasm. This is good practice to help determine the frequency of the eye twitching. In this exercise, note potential contributors to your problem, including your stress level, and intake of alcohol, tobacco, and caffeine. Finally, how well are you sleeping? If you notice your eye twitching is a greater problem when sleep is also an issue, try going to bed 30 minutes to an hour earlier to decrease eye spasms and to help with eyelid strains. As an alternative, you can also seek natural help for sleeping disorders. Gitchel, G.T., et al., “Pervasive Ocular Tremor in patients with Parkinson Disease,” Archives of Neurology, 2012; 69(8): 1011-1017, doi: 10.1001/archneurol.2012.70. Callahan, C., “Acupressure Treatment for Eye Twitches,” Livestrong.com, September 11, 2015; http://www.livestrong.com/article/536886-acupressure-treatment-for-eye-twitches/. “Alternative Treatment for Blepharospasm (Eye Twitching),” EyeDoctorGuide web site; http://www.eyedoctorguide.com/eye_twitching/alternative-treatment-for-blepharospasm.html, last accessed January 18, 2016. “Biofeedback,” University of Maryland Medical Center web site; http://www.umm.edu/health/medical/altmed/treatment/biofeedback/, last accessed January 18, 2016. “How to Stop Eye Twitching,” wikiHow web site; http://www.wikihow.com/Stop-Eye-Twitching, last accessed January 18, 2015. Cherney, K., “Eyelid Twitch,” Healthline web site, November 2, 2015; http://www.healthline.com/health/eyelid-twitch#Overview1. Garrity, J., “Blepharospasm,” Merck Manual Professional Version web site; http://www.merckmanuals.com/professional/eye-disorders/eyelid-and-lacrimal-disorders/blepharospasm, last accessed January 18, 2016. Dubow, B., “Eye Twitching and Eyelid Twitches,” All About Vision web site; http://www.allaboutvision.com/conditions/eye-twitching.htm, last accessed January 18, 2016. Branch, S., “Eye Twitching & Nutritional Deficiency,” Livestrong.com, July 9, 2011; http://www.livestrong.com/article/488307-eye-twitching-nutritional-deficiency/.